Please note that herding is an active sport involving animals that are unpredictable. By contacting PHF regarding any aspect of herding you release PHF and its associates from all liability. Dates are subject to change due to conflicting competition dates, etc. 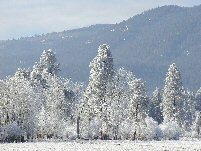 PLEASE CHECK for CANCELLATIONS before you head out. Clinic Fees are $40 for first dog. January 12 Monthly Herding Clinic - Moved to Jan 26 due to weather. The Schedule for 2020 will be posted during Christmas break. Sheep Available for All Levels. No pre-registration is required. Just show up with your dogs, a chair, and a smile. Register and pay when you get here. Participants are welcome to bring as many dogs as they wish. We begin as close to on time as possible and take a lunch break in the middle of the day. You can come and go any time that you like throughout the day. You can work your own dog with or without our help or we'll work it for you. The atmosphere is laid back and friendly. This is an excellent way to introduce your dog to livestock or have it tested for instinct. 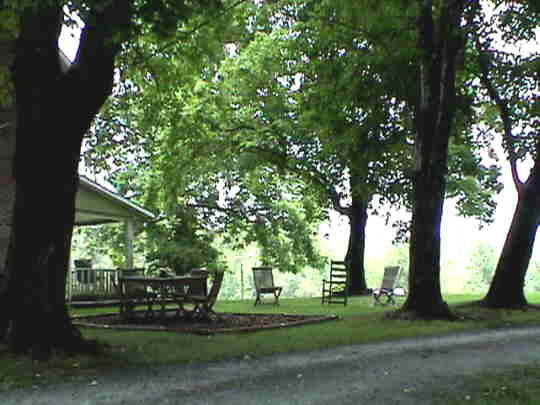 or stay and picnic under the shade trees. All clinics begin around 9:00 a.m. and go until about 4:00 p.m.
FEE: $40 for 1st dog; $20 each additional dog (per handler). No pre-registration required. Just show up and sign up. Need Directions or Hotel Information? Click Here! For more information call or text 828-429-6388 . Private clinics offer a wide variety of services from instinct testing to packed pen work. A nearby country restaurant is available for lunches at reasonable prices. Water pools and shade are available. Let us test the herding instinct in your dog or puppy. Possum Hollow offers instinct testing in a safe environment. We will put your pup or adult dog on sheep and provide you with an evaluation of the level of instinct and current developmental stage that is demonstrated. We will discuss your dog's herding future whether you are looking for a fully trained competition or ranch dog or just an outlet for having a bit of fun with your companion. Instinct tests are basically private lessons and last about 1 hour. Your dog doesn't have to know anything (including obedience) to do an instinct test. Just bring him or her out and have some fun and usually some laughs as the dogs try to figure out just what to do with these strange creatures. Puppies as young as 5 months can be tested and no adult dog is too old. Instinct Test Fee = $45 per dog (includes full lesson). Please call 828-429-6388 for an appointment. Come with your dog to learn about herding. Erin can work your dog for you or she will work with you and your dog together. 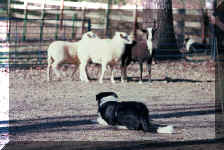 Dogs will be taught in much the same way as described for our Herding Programs above. The dog's advancement will depend on the instinct and talent of the dog, how long the dog remains enrolled, and how often the dog comes each week. Erin can concentrate on training your dog for competition or for farm work. Competition handling is also available from Erin. Dogs need to be at least 6 months old but not necessarily started on stock. We encourage you to attend our monthly Saturday herding clinics to work your dog in a busier atmosphere, meet other new and seasoned handlers and better prepare yourself to handle your trained dog. 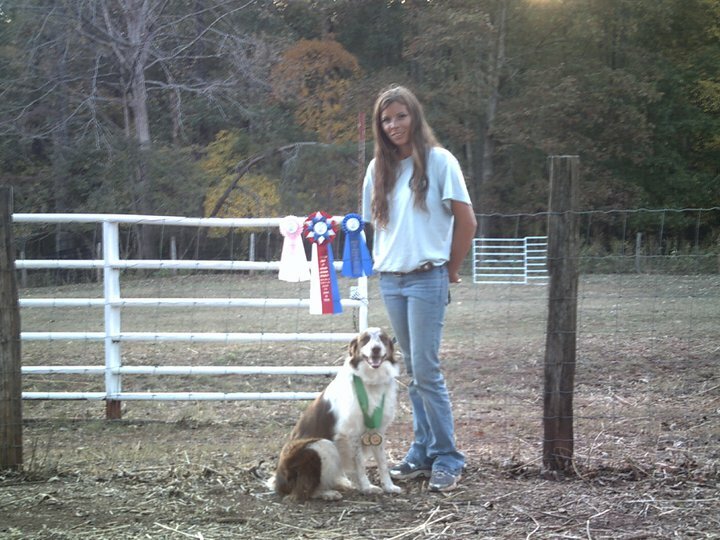 Erin Ledbetter is very good with all breeds of dogs and all levels of handlers and can schedule lessons to fit your schedule. She is a certified AHBA Judge and has competed successfully with her own dogs to championship level. you will receive a 10% discount for each additional dog. HOST A CLINIC IN YOUR AREA! Convenience is the name of the game when hosting. We will travel to your location and provide a minimum of two days of learning and fun. We specialize in working with beginning and novice handlers and dogs but are also able to work with more advanced handlers and dogs. The benefit of hosting a clinic is that we come to you! We bring our own sheep, goats or cattle or you can choose to provide your own. We bring dogs with us to help so don't worry about having to separate and bring out your livestock on your own. Develop interest in herding in your area. By hosting an event at your location, you offer the opportunity for others in your area to learn about herding, try a bit of herding with their dogs, and and develop a circle of herding friends that can enjoy herding with you. Increase the herding skill level for a club. The group level of herding will increase greatly with a clinic experience. Because there is more than just one handler or one dog to observe and more than one set of issues to be addressed, each member of a clinic adds to their overall knowledge through watching the mistakes and methods of others in the clinics as well as their own experiences. What to expect at a hosted herding clinic. AHBA Judge Erin Ledbetter will be your trainer. Occasionally we will bring an additional person to assist in explaining what the trainers are doing while each dog is worked. We try to work all dogs in the morning at least once, take a lunch break, and then work all the dogs again at least once. 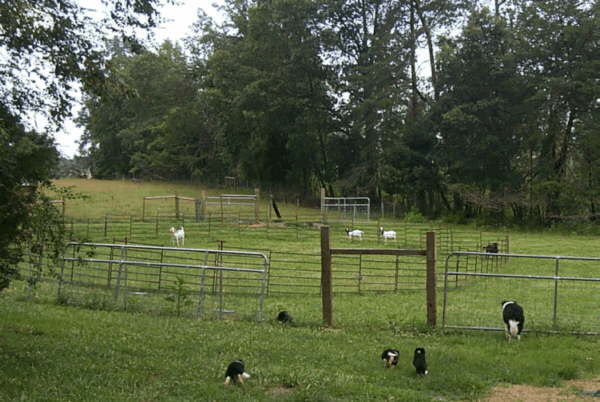 Depending on the facilities and dogs we may work in a combination of round pens, square pens, packed pens, modified square pen methods, larger arenas and pastures. The Host's responsibilities. The host must gather together enough people to make the clinic successful (10-15 people) and handle the payment of fees. They also handle the preparations for lunches (either a restaurant location or provide lunch on site). Host's are not expected to provide food without compensation to participants, but typically provide lunches for the trainers. The host must provide lodging for the trainers at a local hotel. The host also must provide compensation for mileage. Hosts typically take these two expenses out of the fees they collect. Hosts set the fee amounts and must consider their own expenses as well as the fee required by the trainers. Fee = $40 per dog per day (any additional fees are the property of the host). Mileage = $2.00 per mile as indicated door to door using GoogleMaps. Please make your reservations early as there are only 52 weekends in a year. Wanting to get your dog a herding title? Need a handler? Call AHBA Judge and Experienced AKC Handler, Erin Ledbetter. Eligibility: Dogs Eligible for Possum Hollow Handling Services include (1) Dogs already enrolled in a Possum Hollow herding training program or (2) Dogs already trained but needing a handler. Dogs that fall into category "(2)" must be brought to Possum Hollow for several private lessons prior to the event date. Responsibilities of the Owner: The owner must pay for all expenses including travel and lodging, entry fees, etc., in addition to the handler's fee. The owner must present the dog in a clean and healthy condition at the event. Winnings: All trophies, ribbons, plaques and cash prizes are the property of the owner. 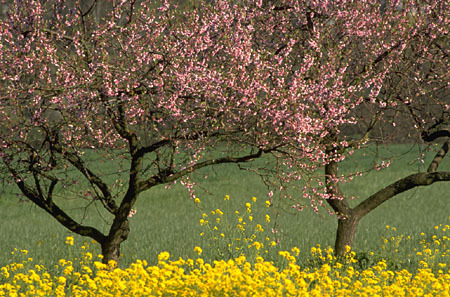 The owner must agree to provide a digital photograph for the handler to use in promotions. Competition Fees: $100 per event day and $50 per travel day. Clinic Fees: $50 per event day and $50 per travel day. For more information: Contact Possum Hollow long before the event to reserve your handler. Call or text us at 828-429-6388 or email us at possumhollow@gmail.com . Possum Hollow provides two wonderful opportunities for learning. Livestock Associations, school groups, clubs, etc., can learn about training and handling working dogs (including herding dogs and livestock guardian dogs). You can come for a visit to a real working farm. 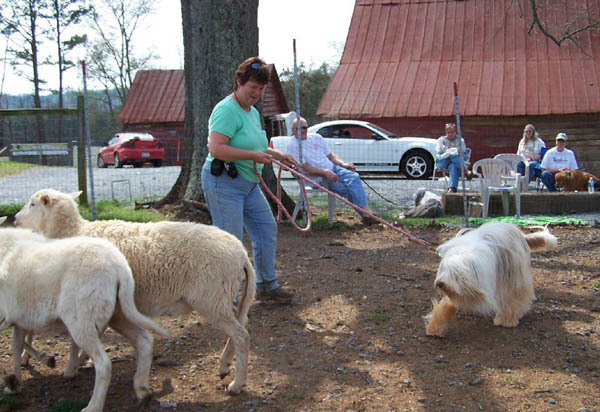 Bring groups of children or adults to our facilities at Possum Hollow to learn about raising, training and handling working herding dogs and livestock guardian dogs. Includes demonstrations of herding dogs of varying ages and abilities on sheep. Also see and learn about Anatolian Shepherd livestock guardian dogs that live in the pasture with the livestock and take care of them. Demonstrations typically last 1-3 hours depending on age group and activities selected. Fee = $10.00 per person with a minimum of $100. A deposit of $50 is due when the reservation is made. Your deposit will be applied to your fees. The balance of your fees is due upon arrival. To make a reservation. Contact us at 828-429-6388 or email info@possumhollowfarms.com to make your reservation. Cancellation of reservations must be at least 1 week prior to the reserved date to receive your deposit back. 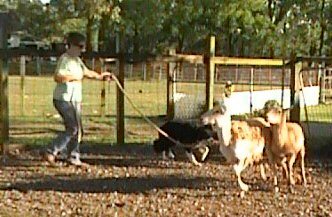 Livestock Associations, school groups, clubs, etc., can learn about training and handling working dogs (including herding dogs and livestock guardian dogs) through a video / slide presentation offered by our Senior Trainer, Vicki Hughes. "Using Dogs to Control Wildlife"
the use of Anatolian Shepherd Livestock Guardian Dogs in controlling predators. For more information: Call or text us at 828-429-6388 or email us at info@possumhollowfarms.com . 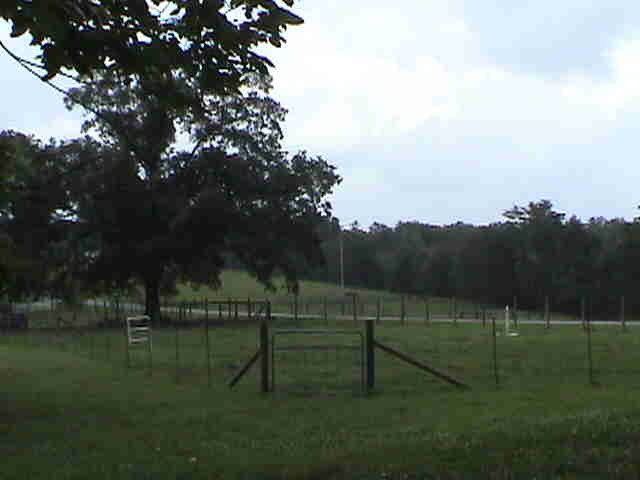 At Possum Hollow we have a double round pen, a regular round pen, a paddock and a Novice field. Our sheep are dog broke but are not knee huggers. They are calm and great for starting future herding dogs. We can provide stock that will move easily or that will challenge the dog. We also have the ability to do a packed pen with sheep for building confidence. We have a 200 x 300 field for AKC and AHBA trials with room for spectators and sheep. Dogs have water tubs available in all sections for cooling off and drinking. Plenty of shade is available for crating dogs and some shade is available for parking vehicles. We have some chairs although it never hurts to bring your own chair just in case there is a big turnout. Space is available for campers but there are no hook-ups. Port-a-Pottys. tables, chairs, tents, etc are available for rent locally. You can bring a chair and bag lunch and eat under huge shade trees while you talk dogs. Or eat with us at a nearby country restaurant. This is a great time for question and answer chit chat with the trainers or judges. Possum Hollow can provide a trainer or clubs can rent the facilities for an established guest trainer. and all kinds of Fundraisers! The facilities at PHF are available for rental including limited livestock. 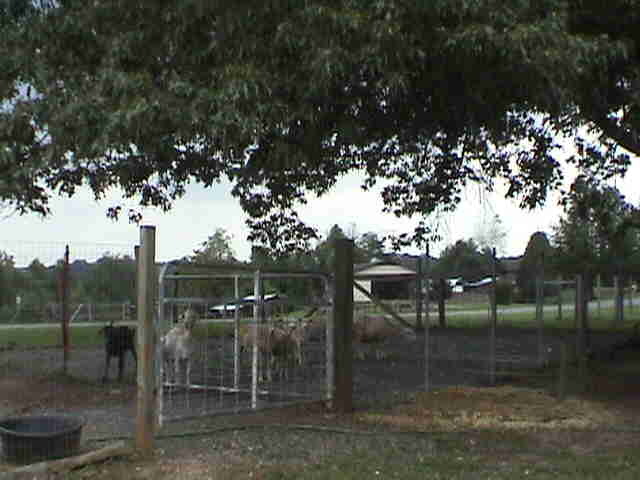 We will provide cattle, sheep and/or goats as needed for competitions, training clinics, practice days, etc. A deposit of $200 is due when the contract is signed. Deposits will be refunded only if the rental is cancelled no less than two weeks prior to the event date. The arena is ideal for agility, obedience, conformation show practice, etc. Completely fenced with woven wire and entirely flat, this part of our facilities is safe and well designed. The arena is approximately 84 ft x 144 ft. Ample room is available for spectator seating with two gates at each end for efficient movement of contestants. No additional equipment is available so clubs must bring their own. A deposit of $100 is due when the contract is signed. Deposits will be refunded only if the rental is cancelled no less than two weeks prior to the event date. To make a reservation call or text 828-429-6388 or email info@possumhollowfarms.com . 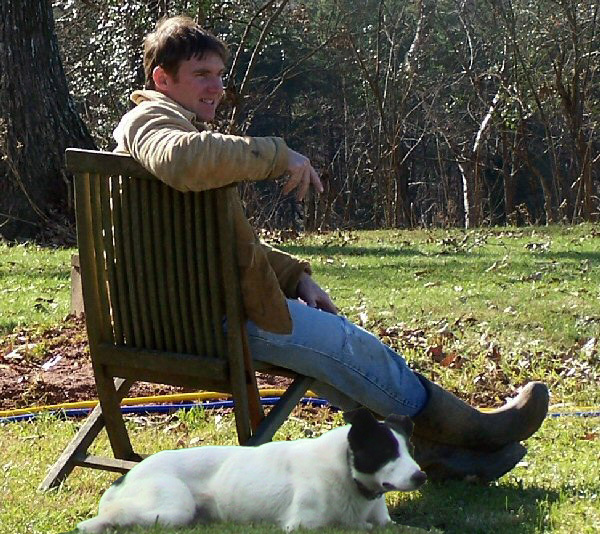 Joe is our Farm Manager and Obedience trainer. Joe does very well with training dogs and families how to have pleasant and enjoyable relationships. Joe takes care of our livestock and dog breeding programs, our Anatolian Shepherd program, and all of the day to day workings of the farm. 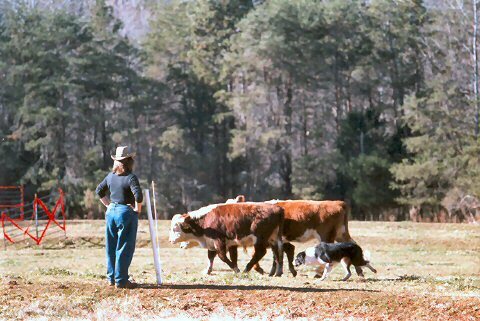 Vicki is an open handler specializing in training dogs to work livestock. She has worked her dogs on sheep, goats and cattle. Vicki has competed with her dogs at the open cow and sheep dog levels. Erin is a wonderfully natural handler and trainer and an AHBA judge. She is very talented with all breeds. She works her own dogs and competes in AHBA and AKC competitions. Erin is available for all of our services.